I spent much of last year remodeling a small (800 square foot) bungalow and a separate studio apartment. I'd like to share photos of the home's new dining room and kitchen/utility room. The biggest challenge with the dining room is that it's tiny, and it's a pass through from the living room to the kitchen. So half the room has to be dedicated to traffic flow. 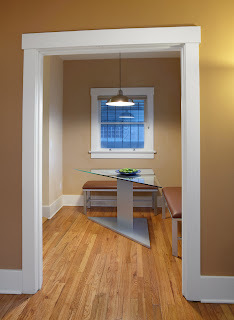 The solution to the problem: a custom triangular dining table and benches. Using a glass tabletop helps give the room a sense of open space. The silver finish of the metal base coordinates with the stainless steel appliances in the adjacent kitchen. Here's a "before" photo, so you can see where we started with the kitchen. As you can see, there was an old O'keefe and Merritt stove that was too big for the room, and the kitchen and utility rooms were separate spaces. The view of the kitchen (below) is taken from the dining room. Originally, there was a wall with a archway between the dining room and kitchen. There also was a wall with a doorway between the kitchen and the utility room. We took out half of the wall and the doorway between the kitchen and utility rooms to create a galley for full-size kitchen appliances and a stacking washer/dryer. In the photo foreground, you can see that we took out the top half of the wall on the leftside and the doorway. We also cut back the wall on the right side, so that the dining area and the kitchen would feel larger and more open while the two rooms also would feel like discreet spaces. 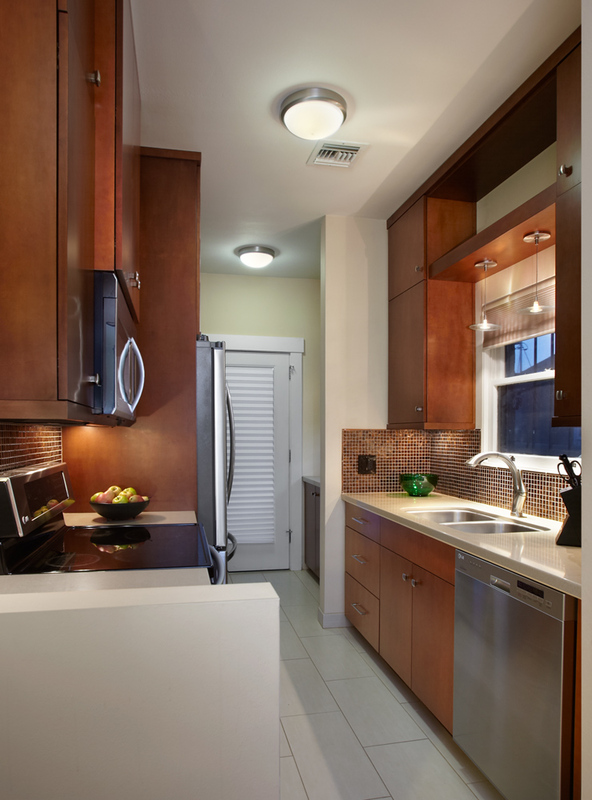 Separate kitchen and utility rooms were combined into a single space. Part of the fun of doing this design (along with knocking out walls) was being able to create a sustainable home. I'd love to be able to include this many green features in every home that I design!